Viking Mountain Lodge is an old, 2200 square foot log cabin located inside the Cherokee National Forest near the Appalachian Trail. The cabin sits high up in the Smoky Mountains about halfway between the quaint mountain town of Hot Springs, North Carolina and the historic town of Greeneville, Tennessee. The two story structure is made of rough cut hemlock logs that are hand hewn on the exterior side. With four bedrooms and two full bathrooms, VML has the ability to sleep 15 guests making it well suited for large groups or family reunions. VML overlooks Paint Creek which runs the width of the four acre property. 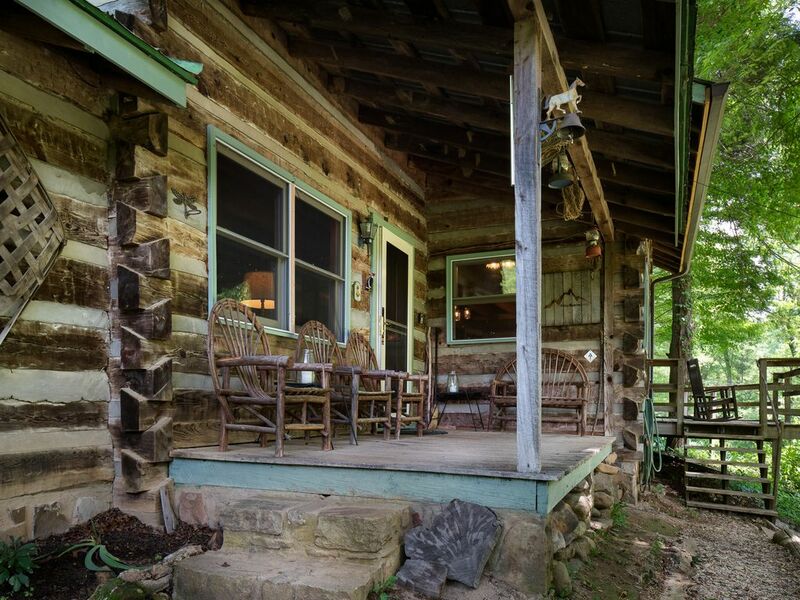 Whether you’re sitting on the front porch in the handmade cypress furniture, on the deck in the rocking/adirondack chairs, or inside with the windows open, you can listen to the peaceful melody from the rushing waters of Paint Creek. Our guests frequently comment that this alone is worth trip to Viking Mountain Lodge. There is a fire pit in the front yard down by the water’s edge for roasting marshmallows or keeping warm on a cool evening. You can trout fish in the creek or catch bream in the larger of the two ponds on the property. Go for a day hike on the AT. Have a picnic on top of Camp Creek Bald. Go whitewater rafting on the French Broad River. Fly fish Big Laurel Creek. Head to historic Greeneville Tennessee and visit one of the many museums. Most of all, RELAX! Although the cabin is rustic, it has all of the amenities of home; a large, fully stocked kitchen, washer and dryer, linens, towels, wood stove, gas fireplace, 6 brand new 5 blade Hunter ceiling fans, gas/charcoal/smoker combination grill, and even a 50” High Definition Plasma TV with 7.1 surround sound for those cold or rainy days. All of this in a spacious, clean cabin decorated with numerous Bev Doolittle prints and many pieces of antique furniture. Although I’ve lived all over the southeast, I’ve spent the last 25 years living in and around the Orlando area. When I was a kid, my grandparents had a summer home in Lake Toxaway, NC that we used to visit every year. That is where I fell in love with the mountains. I’ve always been the outdoor adventure type and that, coupled with my experiences as a youngster, has made owning a cabin in the mountains a lifelong dream. Though I’ve never actually lived there, when I drive up to the Smokys, it feels like I'm coming home. One of the driving forces behind my purchase of this cabin is its close proximity to the Appalachian Trail. I’ve hiked numerous sections of the AT, and this area is one of my favorites. It is the perfect jumping off point for all kinds of outdoor activities. Whether it’s fly fishing Little Laurel Creek (2 miles), kayaking the Nolichucky (9 miles), hiking the AT (1 mile), bouldering at Blackstack Cliffs (8 miles), biking the Paint Creek Trails (7 miles), or having a picnic at 4400’ in Jones Meadow (7 miles), adventure is just out the back door. The cabin is situated nearly halfway between the quaint mountain town of Hot Springs, NC (15 miles) and the historic town of Greeneville, TN (18 miles). Although both offer adventure, relaxation, history, and culture, the best thing about Viking Mountain Lodge is the fact that you don’t even have to get in your car to find something to do. Fish for trout in the creek that runs through the front yard, go for a day hike on the AT, bike along Paint Creek up Viking Mountain Road, or grill out on the deck and enjoy the cool, clean mountain air. On a clear night, walk out the garage and look at the sky, it’s spectacular. Recently installed six brand new Hunter 60 inch, 5 blade ceiling fans. One in each bedroom, one in the kitchen, and one in the living room. These fans are SILENT and move a TON of air to keep you cool in the summer time. Our family rented this cabin for a family get away. My grand kids loved the river that runs in front of it and the ponds. It is very peaceful and relaxing. We will definitely stay here again!! We were thoroughly impressed by the ammenity as well as the location. This was very relaxing for us all and we would have to do it again to take full advantage. Everyone upon keaving kept saying “we need to move here”. Thank you for the hospitality. This cabin was way more than we expected. Had everything you need than some. House keeping was very friendly, house was immaculate. Will return again. Nice place to unplug in a very busy life. Place was as described. Very nice place and area. Would definitely go back. Didn’t spend much time at cabin due to we came for Plott Breed Days and spend time there . Definitely a good place for family to go. My extended family and I were looking for a place to gather to celebrate Christmas in February since we were not able to get together in December. We're in Atlanta and my family is in Virginia so we were looking for a place in the middle. We're so happy we found Alan's Viking Mountain Lodge. The lodge and the property are amazing and perfect for what we were looking for. The cabin is extremely well maintained and had plenty of space for us all to sleep comfortably. Alan was as helpful as could be during our booking process. He even allowed us to check in a little early. We're pretty self sufficient so we didn't have a reason to reach out to Alan during our stay but I'm sure he would have been just as helpful. When you book - Alan provides an EXTREMELY helpful and thorough website and guidebook detailing everything you need to know about your stay and your surroundings. With the help of the guide, we were able to find and hike a portion of the Appalachian Trail. We were also guided to the top of the mountain for an amazing overlook. All in all, we loved our stay at VML. We hope to be back. VML is located just 1/2 a mile from the Appalachian Trail, inside the Cherokee National Forest. Rates are based on up to 2 person occupancy. Add $12.50 per person, per night for additional guests. Cleaning fee is included in nightly price. No additional charge. $100 off 6 night stay! Children 2 years old and under stay for free. We offer a 10% military discount with proof of service.